2016 Rittenhouse WNBA Basketball marks the 20th season of professional women’s basketball. The factory set comes with two autographs in addition to the full base set. The 2016 Rittenhouse WNBA Basketball base set covers players from each of the twelve teams and totals 110 cards. Focusing on rookies and veterans, at least seven players will represent each team in the league. 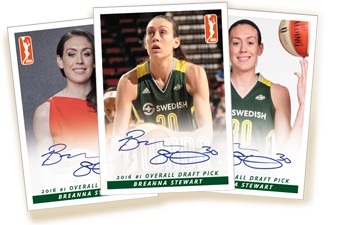 In addition to a complete base set, collectors will find Autograph cards for top 2016 draft picks Morgan Tuck and Breanna Stewart in every box. While the two are included in each set, Stewart and Tuck have three different design themes to chase: Draft Day/Glamour, Posed in Uniform, and Game Action. Morgan Tuck was taken by the Connecticut Sun, third overall, and Breanna Stewart was the first selection in the 2016 WNBA draft by the Seattle Storm. Both players helped the University of Connecticut win their fourth straight NCAA title, and Stewart won Most Outstanding Player of the NCAA Tournament for four consecutive years. 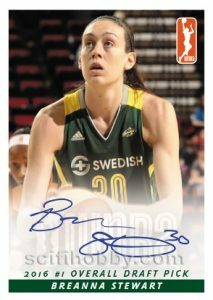 For those wanting to order in larger quantities, there is a 2016 Rittenhouse WNBA Basketball incentive that guarantees all three autographed variations from both players, six autographs in total, for each three-set order. 2016 Rittenhouse WNBA Basketball is limited to 500 factory sets.